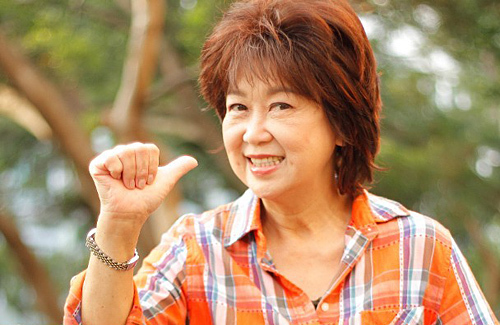 Mimi Chu (朱咪咪) is easily one of the most recognized older actresses among TVB viewers. Her bubbly demeanor and cheerful charisma makes her a staple in many comedy series. Mimi’s friendliness is not only an act for her onscreen roles, but is an actual reflection of her real-life self. She often volunteers at nursing homes performing and singing for elderly residents, and gives them small gifts such as cookies and Chinese essential balms and oils. The Malaysian-born actress was raised in Singapore. Since she has retained residence there, she often returns to Singapore for intermittent stays. During her most recent stay there, the 64-year-old actress made headlines when she was seen saving a 10-year-old boy near the May Flower Market area. The boy, who looked to be around 10 years old, was seen running into a street with heavy traffic. The boy did not look around or pay attention to his surroundings before charging onto the roads and was nearly hit by a bus. Mimi quickly honked her car to let the bus driver be aware. The boy continued running on the highway while is aged grandmother unsuccessfully chased after him. Mimi immediately got out of her vehicle after witnessing the dangerous incident and gave chase after the boy, hoping he won’t get hurt in the heavily trafficked area. Despite her efforts, the elusive boy turned a corner and disappeared from view, and Mimi never caught up to him. However, she later learned from the boy’s grandmother that he is autistic. Mimi recalled, “At first, I thought grandson and grandmother were just playing. But it turns out that the boy has special needs. The grandma really shouldn’t have been left to care for the child all by herself!” Mimi’s valiant act and efforts were met with much positive praise from netizens. Was the event captured on a dashcam?